Apparently in 1933 there was enough understanding of hypnosis to realize something beyond what met the eye and the ear was happening. This is page 911 of Blacks Law 3rd edition, 1933. 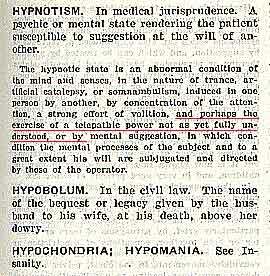 "and perhaps the exercise of a telepathic power not as yet fully understood"
If the definition of hypnosis in a law dictionary includes the possibility of telepathy, you can be certain that there were lawsuits that dealt with the issue. The cases could have been anywhere in U.S. It seem that after the sixties information started to disappear. Books dealing with ancient myth became scarce in the libraries and psychology changed its focus. To support this, look at "EMOTIONS and MEMORY" , 1961, by David Rapaport phD. Memory control is confirmed and a thing psychologists call "transference", could be another word for telepathy. The Hundredth Monkey story underlines the level that animal telepathy occurs socially in a collective. For humans the conscious focus can have a more contrived aspect and still dominate.